Our performances integrate the art forms dance, live electronic music and interactive visuals in a continuous and unpredictable process. The movements of the dancer and the audience are captured by a Kinect and fed into the Turing-McCabe visual pattern generation process. 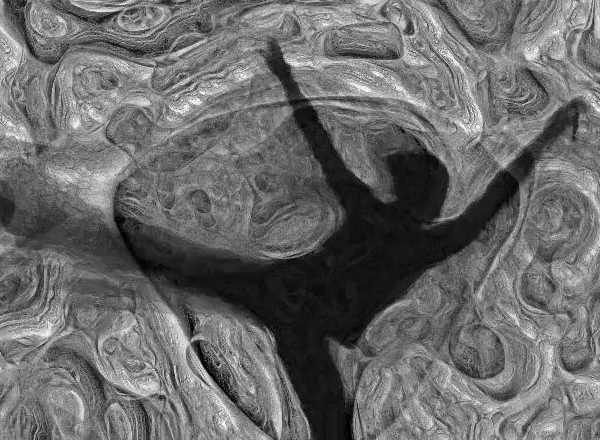 This video shows our first experimental attempt to integrate the movements of a dancer captured by a Kinect with a Turing-McCabe pattern generation process, implemented in the Processing language. Even with a small image size, the process could only deliver few frames per second. This clip was created by letting the dancer move very slowly and then speeding up the display of the frames by a factor of eight.